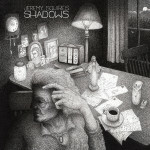 Singing in hushed whispers, North Carolina’s Jeremy Squires is careful not to disturb the ghosts occupying his latest album, Shadows. Maintaining a detached repose, Squires weaves tales of heartbreak and death on songs such as “Carry You” and “Hourglass,” with its hereditary domino effect. An autumnal album, Shadows is largely unadorned, Squires and an acoustic guitar doing the heavy lifting as on “Open,” a song adapted from a poem by Anna-Lynne Williams (Lotte Kestner). Accented by synth touches on “Your Love” and piano and “Glisten,” Williams adds vocals to the latter, as well as “After All” with is welcomed damnation and album closer, “Woven,” perhaps Squires’ finest musical moment to date. For those familiar with Squires, Shadows is a welcomed catching up; for the uninitiated, there is a pensive peace to be found in these stark ruminations of burdens borne. A deeply consoling piece of art, the Vinyl Worthy Shadows is available on CD and digital formats via Shaker Steps. Stream/purchase Shadows below.